Kyle and I would like to say a big thank you for playing at our wedding on the 28th of December at Mt Lofty House. You played beautifully, and your music was thoroughly enjoyed by all. Best wishes for 2018. Just wanted to say a massive thank you for playing at our wedding back in November. I burst into tears as soon as I heard you playing our song Plans. Everything sounded beautiful in the church. Thanks again"
I just wanted to drop you a line so that Tom and I could convey our appreciation for your beautiful music at our wedding at Golding on 12 March 2016. Many people have commented on how much they liked your music. Thank you so much! " Thank you so much for playing at my wedding yesterday! You were fantastic, and everyone loved you. " "Thank you Ken. We enjoyed your music. I will be recommending you to anyone I know who might need music. You were very pleasant and professional". Hi Ken. Thanks so much for last night. I was very happy with your music. It helped create a great atmosphere! We can't thank you enough for your beautiful guitar playing at our wedding ceremony and during pre-dinner drinks. Both Adrian and I and our guests loved having you there. Thank you again for playing at our wedding you did a great job and we were more than happy with your performance, i will not hesitate to recommend you to family and friends. Just wanted to say on the behalf of Nick and I, a big thank you for playing at our wedding on Saturday. Everything went by so quickly, and I was disappointed that we were unable to say thank you in person.....from what Nick and our guests said, you did an amazing job. So glad you could make it, and hopefully you didn't get too hot!! Will definitely recommend you to future brides! Thanks for Saturday. We were thrilled to have you play. It was awesome. Very impressive. We just want to thank you for playing the music at our wedding & reception at Sammys on the Marina recently, we were really blessed by the way you flowed with the afternoon, many of the guest commented on how the music just created an atmosphere that was pleasant and non intrusive. As you were a where we put together our wedding in just over 3 weeks and I have to say you just fitted in prefect. 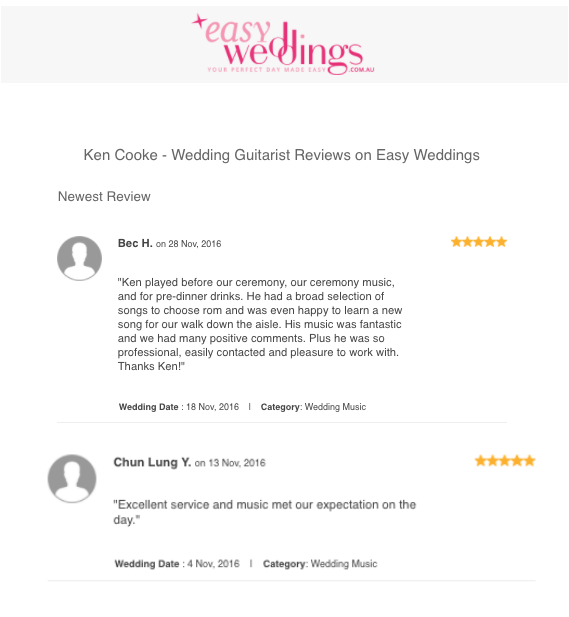 Thanks again Ken we will highly recommend you not only for weddings but for anyone that just wants great music. I hired Ken for my 60th birthday party. He was extremely professional, accommodating and friendly. My guests were very impressed and kept saying how great he was. Ken's music choices were "SPOT ON" for the type of crowd at the party. We allcouldn't have been happier. I would definitely, highly recommend Ken. You will not be disappointed, Ken is an amazing musician. Thanks very much for playing at our wedding on 7th November 09. Sorry I didn't get a chance to chat with you but I enjoyed listening to you, playing your guitar and I know others did as well. Leading up to the wedding you were very helpful, friendly and professional. Thanks again and I would recommend you to others! We enjoyed your playing....really enjoyed the ceremony part...thank you for playing at our wedding. We hired Ken, Paul and Susan four our wedding day. We wanted a romantic live acoustic sounds and instrumental music during the ceremony. They also continued to entertain guests during the celebration drinks. Our guests all commented on the live music adding a beautiful touch to our outdoor ceremony. Conditions were perfect and the music was beautiful! Thank you so much for playing it was a perfect day!! April 3 2010 - Pennington Gardens, North Adelaide.